Flat roofing is a popular way to finish off many buildings and extensions, such as porches, garages, dormers and more. We only install waterproof flat roofing to the highest of standards and offer this service to our industrial and commercial customers. All our roofs are 100% recyclable, energy efficient, environmentally friendly and very cost effective. They will protect your property from the bad elements while making it look great. When we are asked to fit a roof we would normally use single ply roof membrane, which is suitable for use on residential, commercial and industrial properties. This innovative and eco-friendly way of roofing a commercial or domestic property means that you benefit from a low maintenance roof – the perfect solution, which gives you a fantastic alternative to felt and lead roofing. Single ply roofing has been used across Europe and the UK for over 30 years, and is the preferred method in flat roofing. The single ply material is popular because of its flexibility and low safety risk. It is strong enough to walk on, yet will not be susceptible to tearing. It expands in hot weather and contracts when the weather turns colder, and will not crack or split when exposed to extreme elements – unlike felt. 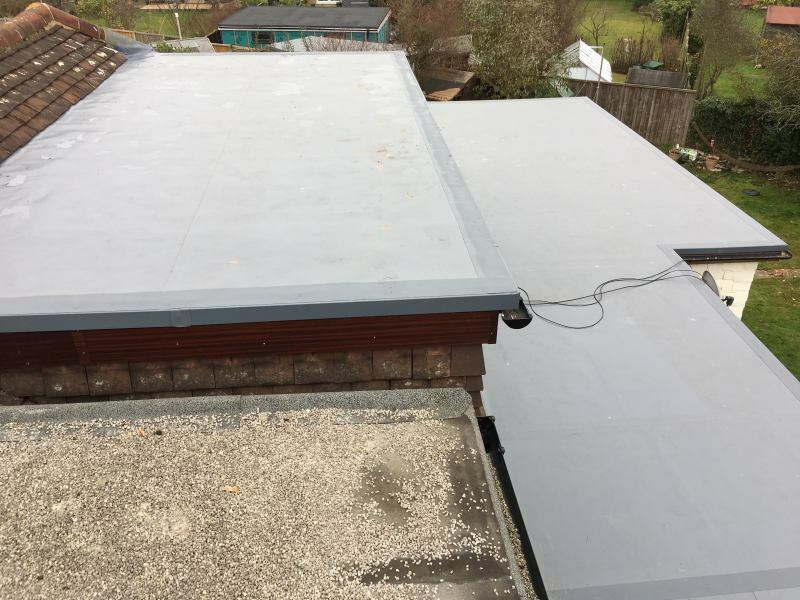 If you would like a single ply flat roof then a member of our team can come and give you a no obligation quote and then once you have decided that you would like us to do this then our superior team will fit your new roof at a convenient time to you. We offer incredibly competitive prices, along with an impressive 20 year guarantee. The single ply roof has been proven to last in excess of 50 years, so you can be assured that your long lasting flat roof will not need to be repaired or replaced in the long term. This is true value for money when the roof will last almost a lifetime. If for any reason something was to go wrong with your roof due to bad weather or for any other reason, you just have to contact Essex Roofers and we will be there to assess any problems you may have. We will always offer a free, no-obligation quotation to any of our customers in Essex. We are so confident that our prices are lower than any other Essex based roofing company, that we will beat other written quotes by 10% – a great deal in anyone’s book. Please contact us today to find out more about the superb flat roofs that we can install to existing or new buildings.